Hot springs are by definition springs whose temperature is at least 10 oF above the average annual temperature for an area. Water that is only 5 o F higher than the average temperature is termed a "warm spring". This is aside from the mineral and bacterial content that many hot springs have. So how does the water get naturally heated? There are two ways to do this: from contact with igneous rocks, and from deep circulation and the geothermal gradient. Courtesy Wood Hole Oceanographic Institute Hot igneous rock rising towards surface can heat downward circulating circulating groundwater. In its most spectacular example, this water erupts as geyers. Where the molten rock is deeper below the surface, such as in a collapsed volcanic caldera, it can give rise to large areas of hot springs. Yellowstone National Park is an excellent example of this. Other major hot springs areas related to igneous rocks are found in New Zealand and Iceland. The far more common way for hot springs to form is by deep water circulation and heating from the geothermal gradient. As you drill deeper into the Earth, the rock naturally increases in temperature, about 1 o F for every 100 feet of depth. This gentle temperature change is due to heat from the Earth's molten core rising towards the surface. 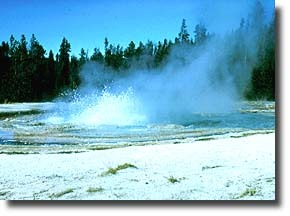 Water circulating 1000 feet below the surface should increase in temperature by 10 o F, enough to make it a hot spring. Other factors are at work however, since the incoming ground water is probably much cooler than the surrounding rock, and the water will also cool down as it rises to the surface. So to get really hot, the water must circulate from 5,000 to 10,000 feet below the surface. This usually means that the input area is part of an adjacent mountain range. Click on the Next button to see an example!